The focus of IRG-2, Sustainable Nanocrystal Materials, is the design, synthesis, processing, and thin film properties of environmentally benign nanocrystal-based electronic and optoelectronic materials. The field is currently constrained by the use of toxic (e.g., Pb, Cd) and/or scarce (e.g., In, Te) elements, with serious environmental, health, and economic concerns. IRG-2 will overcome these barriers by discovering and developing nanocrystal-based electronic thin films made from nontoxic, abundant and sustainable materials using scalable, low-temperature processes. 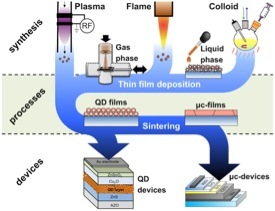 The IRG's research will pursue three closely linked, vertically integrated thrusts: (i) nanocrystal synthesis and characterization; (ii) quantum dot films and devices; and (iii) microcrystalline films and devices. This research aims to reinvent the scope of active materials for NC-based electronics and optoelectronics, which will ultimately enable energy efficient emissive or photovoltaic devices with sustainable materials choices.